"The Prussian-born musician took it upon himself to record traditional Hawaiian hymns, chants and other Hawaiian music in print to ensure their survival, a task never done before. Berger at the same time composed the classics: ""The Hula March"", ""Hilo March"", ""Kohala March"" and ""Sweet Lei Lehua."" His arrangement of "" Hawai ’i Pono ’i "", with text by Kalākaua in honor of Kamehameha became the national anthem. Today, the song serves as the state anthem. 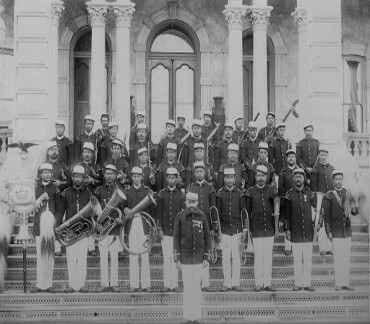 Berger combined German, Austrian and Hawaiian traditions in his unique compositions and performed with the Royal Hawaiian Band thousands of times, making Hawaiian music known and popular in many countries." Komponist (1844-1929). 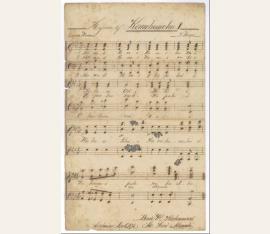 Autograph musical manuscript signed ("H. Berger"). Lahaina. 1 S. Vier zweizeilige Systeme mit zusammen 16 Takten und drei Strophen unterlegtem Text auf Hawaiianisch. Folio. 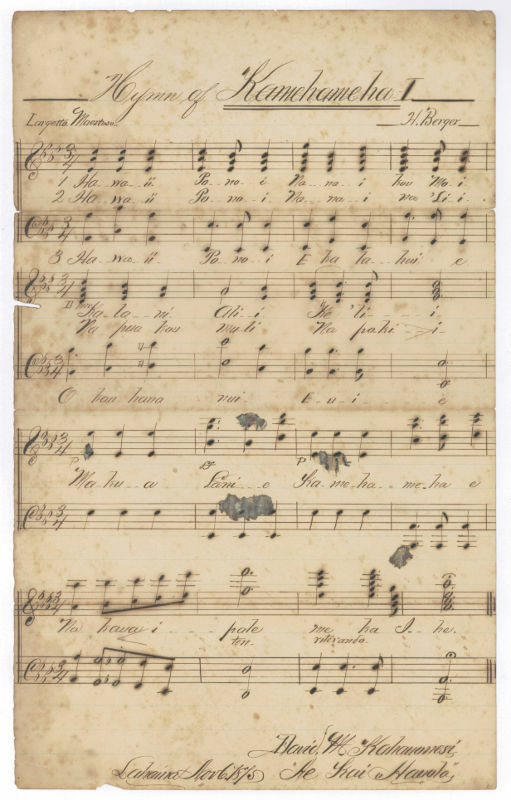 Autograph transcript of Hawaii's National Anthem which Berger composed in the year before and which is still valid up to now under the title "Hawai'i Pono'i". Its words were written by King David Kalakaua (1836-91), the last reigning king of the Kingdom of Hawaii, who dated and signed the present copy as "David M. Kahanonesi, Re Kai Hanola". - Berlin-born musician Henri Berger arrived in Hawaii in 1872, having been commissioned by the King to turn a handful of local musicians into a royal orchestra. Berger was closely affiliated to the Royal Family, served as Royal Bandmaster up to 1915, and acquired lasting merits for his efforts to transcribe literally hundreds of traditional Hawaiian melodies, saving them from oblivion. - Somewhat spotty, edges with some browning; small tear in the lower left margin..